Fuji Steak House is one of Florence’s best Japanese local restaurants, specializing in teppanyaki, sushi, and other made-to-order Japanese dishes. The beautiful hibachi grill is the star of the show and is used to create a number of different delicious dishes. This Japanese steakhouse offers a wide range of dishes cooked on the hibachi grill including tender chicken with sesame seeds, juicy filet mignon steak, fresh scallops, seared lobster, and succulent shrimp. Get combo plates if you can’t pick between surf and turf or get a dinner special for two people so you can share a feast with your loved one. Hibachi meals are all served with clear soup, house salad, a shrimp appetizer, and steamed rice. Get their finest hibachi vegetables, hibachi fried rice or noodles for an additional $2.50. 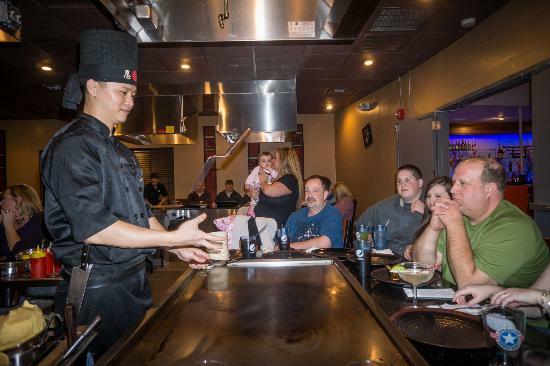 The Japanese steakhouse is also great for family parties and get-togethers. You can choose to order or custom-build your own menu to make it a special occasion. The knowledgable staff and experienced chefs are happy to ensure you have a wonderful time at this unmistakable steak house. To make a reservation or request a custom-built menu, contact Fuji Steak House today. Call (859) 746-8180 or visit their website for more information regarding the menu or specials. Remember to visit on Tuesdays from 4-10 pm for half priced sushi rolls! And if you find yourself traveling out of Florence, keep in mind that there are also three locations in Cincinnati!